A Wisconsin school district was profiled for their efforts to improve student literacy achievement. Using a common instructional framework and existing resources, the K-4 staff carved out 30 minutes of their school day for intensive learning support for students. They worked on “a variety of skills, including sentence structure, descriptive words and spelling”. Kids are flexibly grouped based on current assessment data and progress. To prepare for this type of instruction, teachers used collaborative planning time to make responsive decisions, as well as to “exchange ideas, offer feedback and set strategies”. While the district has observed increased student achievement, “the most important thing is we’ve already come back now twice and refined what we’ve done.” Continuous professional growth is as much a driver as is student achievement. The director of research and policy for Getting Smart highlights the confusion in present-day discussions about innovation in teaching and learning. There are many “movements” circulating the various educational conversations: blended learning, competency-based learning, digital learning, personalized learning, and online learning. Schneider explores “how dots could connect and lines could intersect”. What she has discovered is all of these movements have a similar focus on developing “deeper learning”, with an “emphasis on core academic content, critical thinking & problem-solving, collaboration, effective communication, academic mindsets and self-directed learning”. Schneider encourages all educators to become more active in seeking alignment about best practice, and add their thinking to the conversation. School vouchers, which allow families to attend private schools using taxpayers’ dollars in the name of school choice, is an increasingly hot topic in Wisconsin and throughout the nation. The most recent focus involving vouchers is a push by legislators for private schools who accept public dollars to be held accountable for student achievement and growth. Specifically, Representative Pocan and colleagues are requesting a federal review regarding “academic achievement, student demographics, financial accountability and transparency, student turnover rates and service of students with disabilities”. 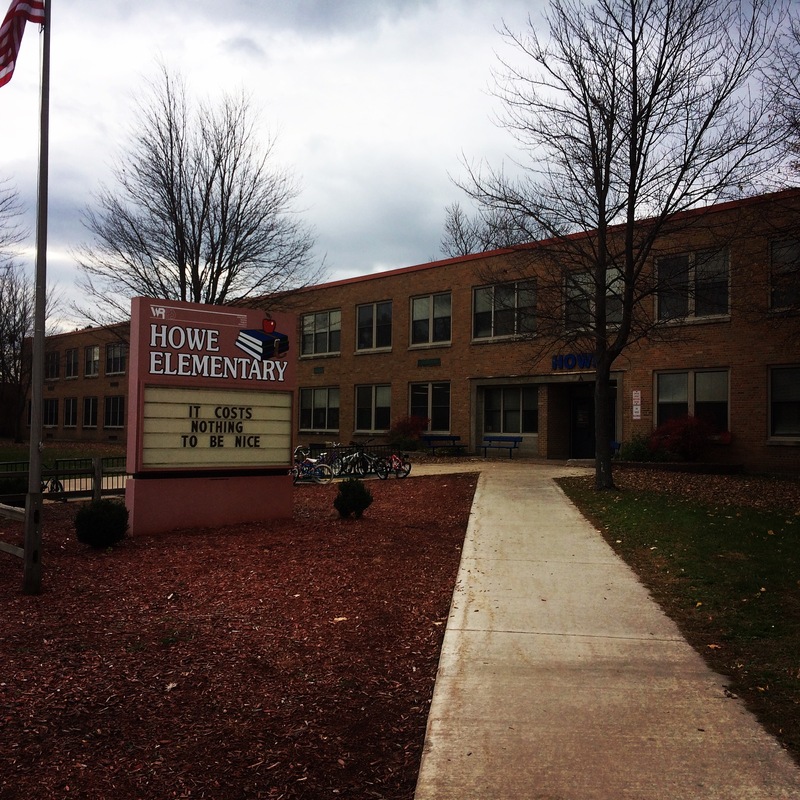 Also of concern is the current federal investigation regarding “whether private voucher schools in Wisconsin were denying admission to or properly serving students with disabilities”. Heick, a former English teacher, shares his provocative thinking about how education is changing in light of the advances in technology and connectivity. He is surprised that digital learning is still playing second fiddle to other topics of discussion in educational circles, such as assessment and PLCs. His subsequent points serve to make his case. Some of his statements find broad agreement, such as “Students have real options”. Others, such as “Digital media is more engaging than non-digital media”, are more controversial and invite discussion in the comments. Heick closes out his commentary by calling on public education to “compete with other possibilities that are frankly more compelling, creative, and social than marching through indexed curriculum”. Dillon saves the discussion about digital tools for last, noting that they “quickly become relics” and therefore should not lead the learning. He has found that “story inspires story”, and that “best practices in education will grow and scale whenever we all release trapped or siloed wisdom into the system”. Check out Gepeto: Next-Generation Storytelling! How will you know that this program is effective? They explained that they have to present their findings to the district’s board of education later in the school year. This question and response is important for two reasons. First, their colleagues and our school community are observing how we as educators are holding ourselves accountable for how well our students are learning in school. This is a smaller but similar process the Kimberly School District has engaged in, called action research. While the achievement that Kimberly chose to measure for literacy are more outcomes of good instruction, they do have a process and a plan in place to continue to improve their practice. Second, and this is very similar to the first reason, when we make visible the process of learning for a broader audience, both what works and what does not, we “trouble the image” of people’s perceptions about what school is and can be. The picture of my school at the top of this post says little about what is happening inside. It is good to be connected (I shared that image out on our school’s Twitter account), but just posting surface-level information does little to shift the paradigm that the public may have of schools, from brick-and-mortar institutions to dynamic learning environments. 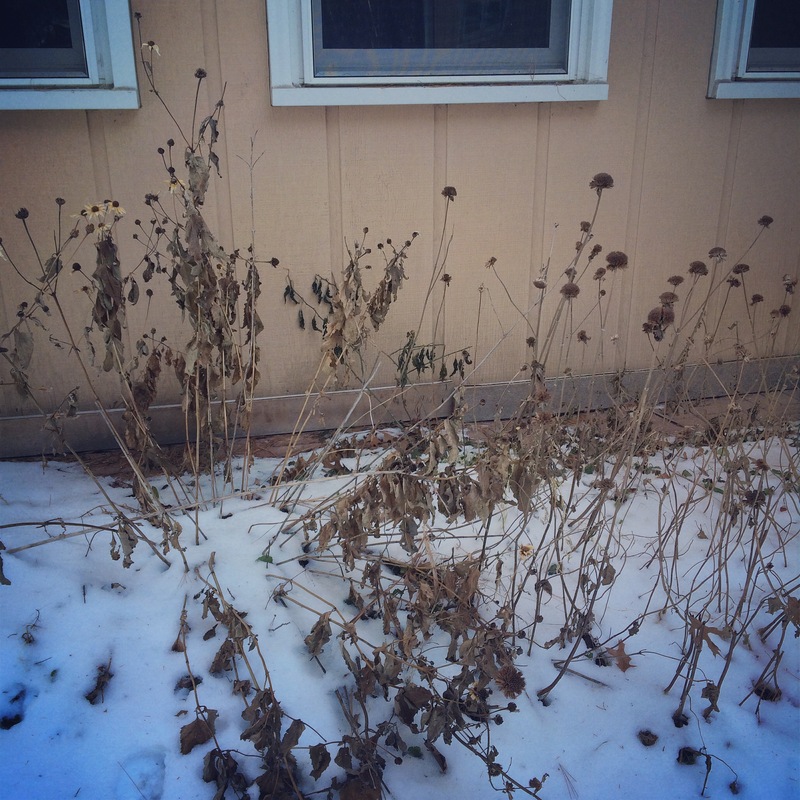 As you prepare for winter break, take some time to reflect on the authentic and meaningful learning experiences occurring regularly in your classroom, and then ask, “How will I share this?” Start by developing your personal learning network and engage in conversations about topics such as the deeper learning movement. Challenge the thinking of those making provocative statements, not to prove them wrong, but to increase that community’s collective intelligence. 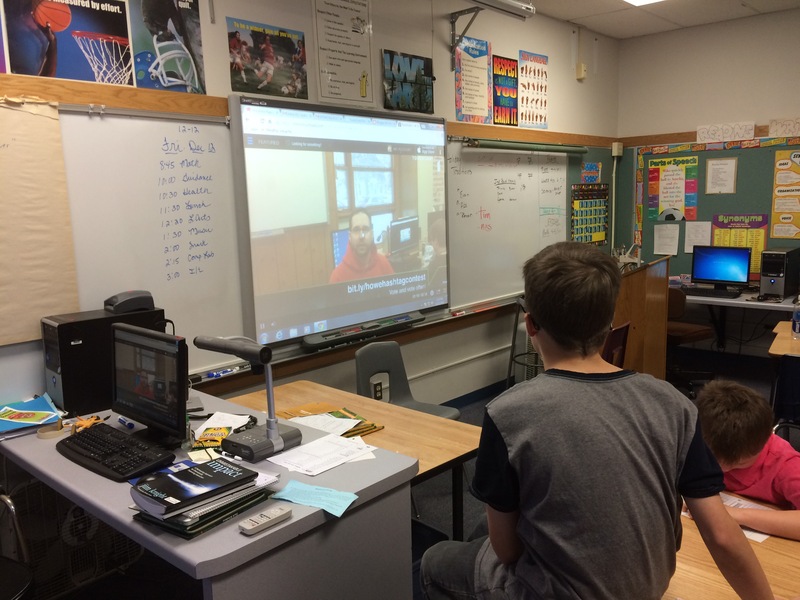 Have your students share their learning using digital storytelling tools. Heck, tell you own personal learning story with a blog. 5th graders helped me create a video newsletter with the app Touchcast. We shared our good news with the school community. Because to not share the important work you are doing creates a void in the conversation. It permits those who have a different agenda to speak their own truths about programs that can be harmful to education, such as vouchers. Even if what they have to share is false, who is going to be there to refute it? It has to be us. We are the closest to the source (the classroom) and have all the necessary tools at our disposal. So what is stopping you? In other words, how are you going to trouble the image? This website highlights a framework developed by Juliet Hinrichsen and Anthony Coombs from the University of Greenwich. Their purpose: To provide a conceptual understanding of how we read in the informational/digital age. 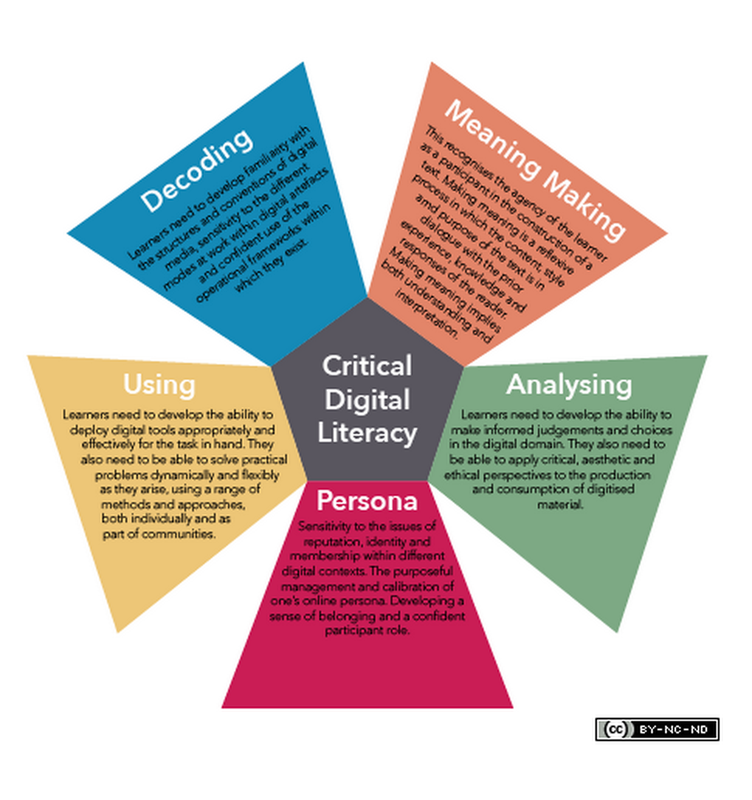 These five domains and descriptions may be a departure from our current understanding of literacy. For example, learners need to “develop familiarity with the structures and conventions of digital media”. This standard would likely include the use of hashtags and the difference between saving and publishing. In addition, educators should understand the “issues of reputation, identity and membership within different digital contexts”. Maryanne Wolf: Balance technology and deep reading to create biliterate children by Joan Richardson (Phi Delta Kappan, November 2014). In this interview with literacy researcher Maryanne Wolf, Richardson investigates the current status of deep reading in the age of digital texts. She also inquires as to how educators might want to change their instructional approach. Dr. Wolf shares from her findings that reading an eBook, such as on a Kindle, does not adversely affect comprehension when compared to reading in print. At the same time, Dr. Wolf recognizes that learners need to be taught how to select the format of text based on the purpose for reading. She highlights her own experiences in reading on a screen. “I become more like the medium: I read for speed and immediacy.” The interview is concluded by Dr. Wolf proposing a new term for the educational lexicon – “biliterate”, or the ability to successfully read both in print and online – to describe the new expectations for learners in the 21st century. Bill Ferriter, a middle school teacher, shares his frustrations with regard to a series of negative comments his students received on their blog. Mr. Ferriter and his class are actively involved in sharing information about the negative affects of sugar on human health, using the hashtag #sugarkills to connect their thoughts. One commenter pointed out the possible errors in the students’ thinking, apparently unaware of the effect his negative responses had on the students. Mr. Ferriter deleted this person’s comments, and lamented on whether providing a global audience for his students is worth the risk. This working paper describes a study conducted three years ago, regarding the connection between reading and videogames. Dr. Steinkeuhler points out the decline of males pursuing post-secondary degrees, as well as the increased likelihood that boys are being diagnosed with ADHD. Dr. Steinkeuhler also questions the negative perception of video games, and how many assume that this activity takes away time from boys actually reading. 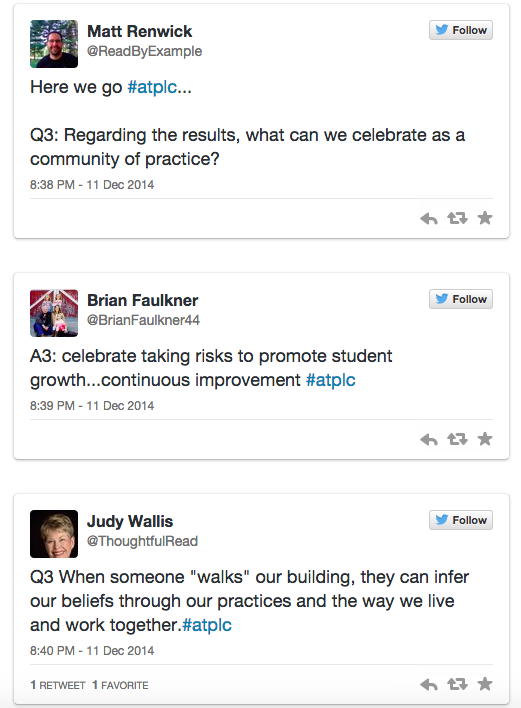 I hosted my second Professional Learning Communities (PLC) Twitter chat on Thursday night. We use the hashtag #atplc, a community supported by Solution Tree, publisher of many PLC resources. Our topic for discussion: Beliefs and Values. We tried something different that night. Instead of our regular Q and A, I posted a Google Form to survey the participants on their own beliefs about PLCs. Out of seven statements, we found total agreement on one. I shared out the results to the participants, which then directed our subsequent discussion in the chat. From the moment I shared out our beliefs survey and started watching the results, the Twitter chat stopped existing as a Twitter chat for me. It became an authentic examination of our beliefs as a community of practice. The technology faded away as I shared out the final results, read the participants’ responses, and followed up with questions that would help the discussion reach deeper levels of learning. It is in times like these that I realize technology is more than just a tool. Just like the professor who assumed the role of a student from a previous post, I have found that technology is a context for learning and not merely another tool for instruction. The chat I just described would not have occurred without the affordances of what is possible online. To designate digital access as anything less than this may reflect a lack of experience or understanding in the possibilities. I have been guilty of this misconception in the past. The five highlighted articles here all have one thing in common: The discussion is not about whether technology is necessary, but about how technology can best be applied to the context of learning. Sometimes this context may need help to be realized, such as allowing library patrons to check out WiFi hotspots, or exploring the effects of video games on boys’ reading comprehension. But the more technology becomes an integral part of the learning process, the less it feels like technology at all. It is often simply how we learn. We bring the technology; you bring the imagination. Gepeto Crowdfunding Video from Yugen on Vimeo.